"The package came today; it fits my "Lily" beautifully. You both have been wonderful. Your concern and the customer service was excellent. The books and figurine were everything I thought they were going to be and more. 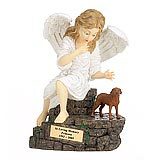 I started to cry when I opened the box Lil's final resting place is wonderful. " 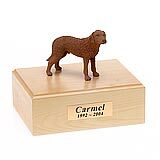 All available Chesapeake Bay Retriever dog urns and memorials will be displayed with the figurine on the Chesapeake Bay Retriever urn you select and in the appropriate size.